From our 15,000 sq. 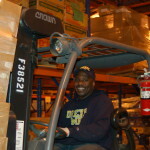 ft. facility in Ewing Township, outfitted with walk-in freezers and refrigeration, loading docks, and two-tier racking system, the Food Bank receives and distributes donations as small as a few cans of soup to a bin of just-picked Jersey Fresh produce, a pallet of assorted groceries culled from supermarket shelves, or a tractor trailer load of cereal. 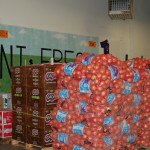 The Food Bank obtains its inventory of food and groceries from a wide range of sources: the US Department of Agriculture; food producers such as manufacturers, packers, and processors; food businesses such as distributors, wholesalers, and retailers; farmers and growers; community food drives and food collections; and individual donations. Our efficient and effective food procurement and distribution system is a vital community link ensuring that people in need can access take home groceries or wholesome meals from a charitable food provider in their neighborhood.